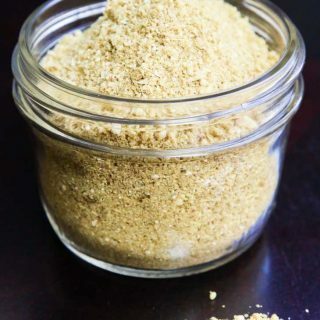 This Easy Indian Spice Blend is a savory dry mix of chickpea flour, ground peanuts, coconut, and some of my favorite Indian spices. Use this simple spice mix on so many different dishes to give a delicious punch of flavor! If you’ve never cooked using Indian flavors before, this Easy Indian Spice Blend is a great place to start. It’s a savory dry mix of chickpea flour, ground peanuts, coconut, and some of my favorite Indian spices. It’s perfect to have on-hand in your fridge and an easy way to jazz up any boring vegetable dish. This recipe has been in the family for as long as I can remember. Growing up, my mom and grandmother made huge batches of it to use in their cooking. The kitchen was always aromatic. They would stuff it in vegetables such as eggplants and potatoes, or sprinkle it on vegetables (such as opo squash, zucchini, tindora, okra, Chinese okra, etc). One of my favorite traditional Indian Gujrati dishes using this savory dry mix is Stuffed Eggplant & Potatoes (recipe coming soon). It was the dish I craved the most when I’d come home from college and has remained a favorite in our household. This Easy Indian Spice Blend is now a staple in my fridge. I typically make a huge batch and store it for months. I have some recipes coming to the blog soon using this mix, but until then, simply saute/cook your favorite vegetable stove-top, sprinkle this blend half way through cooking, cover pan to trap in some moisture, and mix it in. Season with lemon juice to taste, and that’s it! So easy, so delicious, and a healthy way to season those veggies. To Use this Mix: Saute/cook your favorite vegetable stove-top, sprinkle this blend half way through cooking (few tbsp at a time only), cover pan to trap in some moisture for a few minutes, and mix it in. Season with lemon juice, chili powder, and/or salt to taste. The term ‘Coconut Powder ‘ is used to describe several coconut-based food products. For this recipe, ‘Coconut Powder’ refers to finely shredded or ground coconut. You can find it at Indian stores, or simply sub any finely shredded unsweetened coconut. Please do NOT replace it with Coconut Flour in this recipe as it’s properties are completely different and the recipe will not taste the same. Aasafetida – Also known as hing (omit for gluten-free option unless you are certain it is pure). To make the ground roasted peanuts, simply pulse whole roasted peanuts in your blender. I use my Cuisinart Hand Blender w/Chopper-Grinder Attachment . This savory dry mix is perfect to have on-hand in your fridge and an easy way to jazz up any boring vegetable dish! In a pan, heat cooking oil on low-medium heat. Add the chickpea flour and roast for 2-3 minutes, mixing frequently, until it starts to become fragrant. Add the corriander-cumin powder, turmeric, asafetida (if using), salt, sugar, ground roasted peanuts, and coconut powder. Combine and mix well. Roast with heat on the pan for another 5-7 minutes. Turn off and remove the pan from the heat. Allow the masala to cool completely. Store in an air-tight container in the fridge for use when needed. For a quick suggestion on how to use this masala, see the notes below. Each serving size is 1/4 cup of the dry mix. The term 'Coconut Powder ' is used to describe several coconut-based food products. For this recipe, 'Coconut Powder' refers to finely shredded or ground coconut. You can find it at Indian stores, or simply sub any finely shredded unsweetened coconut. Please do NOT replace it with Coconut Flour in this recipe as it's properties are completely different and the recipe will not taste the same. Aasafetida - Also known as hing (omit for gluten-free option unless you are certain it is pure). Easy ways to add flavor are always much appreciated since I really don't know what I'm doing with herbs and spices and savory things. It's neat that you condensed the flavors down into one powder, especially the peanut and coconut. And I love that this could be used on most anything! Recipes for ingredients are the most practical kind. Haha! Well it's ok since you're AMAZING at all the sweets and desserts which I realize I don't post much of...so it works out perfectly for me Natalie! Yes this blend can really be used on so many different veggies. And it's so flavorful and well balanced that you don't really need to add anything else! Let me know if you try it out! I love love love making my own spice blends! Since my spice cabinet is my pride and joy and I have just about every spice or herb there is (and buy every new one I find) I have SO many on hand, making blends is the best and easiest! That's awesome Rebecca! I actually have most of the individual spices, but rarely make blends. This one being the exception...I ALWAYS have a batch of this ready to be used in my fridge. Oh my gosh, I love the idea of this spice mix! I adore Indian foods, but it does sometimes take awhile to assemble all the spices. This would be perfect to make in a big batch and keep in the pantry. Love it! Thanks Jenn! It's perfect just for that...I cook Indian in my house at least twice a week and I come up with my own spice blends sometimes, but this one is by far my favorite! I've used it over so many veggies. I have a few recipes using this blend coming soon! This sounds so so nice! I would love to experiment more with Indian cooking! Thanks Hedi! This is the perfect spice blend to experiment with, especially if you're new to Indian cooking since it's full of flavor and makes it really easy. Thanks Reshana! It's very versatile...I use it over so many veggies and I"m still finding new ways to use it. I have a few recipes coming your way soon! I can see so many great uses for this. I'd love it over some fresh vegetables! Thanks Kelly! 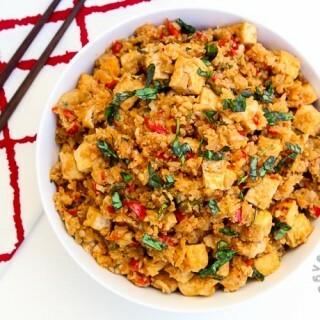 This mix is very flavorful, and the chickpea flour gives the vegetables that added fullness. I love making my own spice blends. This one is great, I'm loving all of the spices in it. Thanks Linda! You'll love this one then...it has many flavor packed components and is really versatile. I love making my own spice blends but have not tried indian. Thanks for sharing! This blend is super easy to make, and is a great way to introduce Indian flavors. I have a large collection of homemade spice blends in the kitchen so this one is just another wonderful blend to add. I'm looking forward to the stuff egg plant and potatoes recipes as I tend to be one dimensional when cooking aubergines. Oh you will LOVE it!! 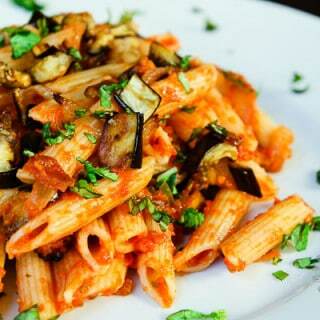 By far one of my favorite uses of eggplant! That and Thai basil eggplant (which btw is the number one recipe on my site, so you should check that one out as well!). Hoping to get the stuffed eggplant recipe out in the next few weeks. I love that this blend doesn't contain cardamom, which I'm allergic to, and is found in some curries and garam masala. I always feel like Indian food is off limits for me, so I'm excited to know I have other options! You're right...cardamom is in many indian slice blends. I cook a fair amount of indian food, but this recipe is by far one of my favorites! So I'm sure you will love it! Let me know if you try it out. What a good way to spice up vegetables! I love the cumin coriander pairing, so would love to try this! Thanks Melissa! the spices are very simple and all work so well together! I would never have thought of adding chickpea flour to a spice mix, that's so clever! Thanks Lucie! The chickpea flour gives it that extra full-feeling since it cooks right in with the moisture from the veggies. I love this spice mix! 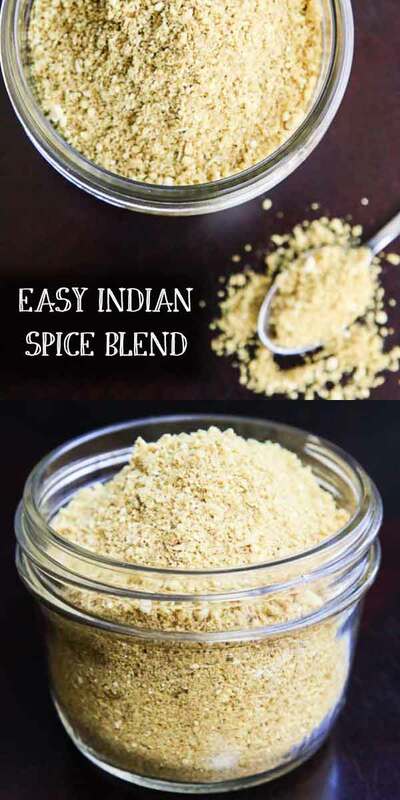 It's so much easier to have a blend to start cooking new foods with and this one is unique to all the Indian spice blend recipes I've made before. Yum! I completely agree! It's perfect if you're new to Indian cooking but still wnat that great flavor. 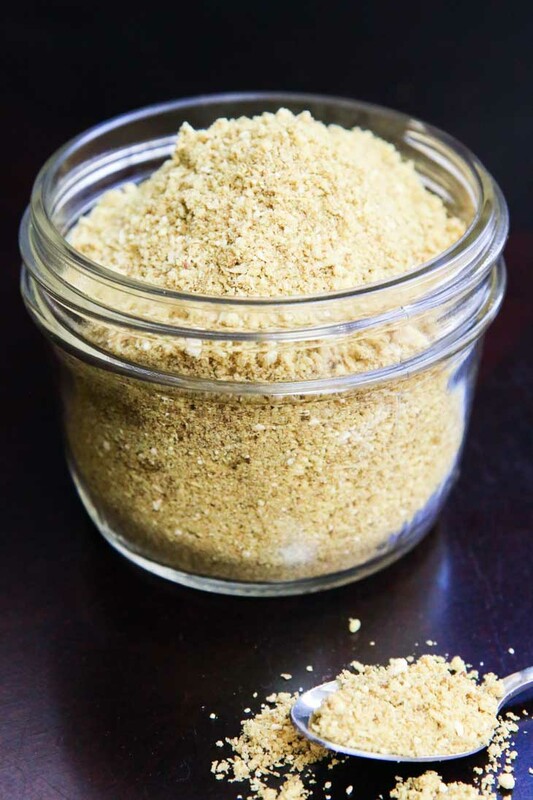 I always have a jar of this dry spice blend in my fridge and use it for many dishes. It's quick and delicious. I have a few recipes coming to the blog soon! You will LOVE it! The flavors are great, and they pair so well with many other veggies, especially stuffed eggplant! i am really interested to make this spice blend because im not a huge garam masala person so this will be a nice addition instead to my veggies especially. I'm actually not a huge garam masala fan either, which is why I don't care for many indian dishes at resturants since they use a lot of garam masala. If I use it, it's only in small amounts. You will love this blend! I use it for several veggies when I'm looking for bold flavors, and I stuff it in eggplants and potatoes! I have a few recipes coming out soon. Girl this is such a great idea to make Indian cooking more reachable! Love it! Thanks Ami! Many people have requested the recipe so I finally had a chance to write it down! What a great blend! I love your addition of chickpea flour. Thanks Gin! The chickpea flour really helps all the elements come together and give the dishes it's used in some substance! I love using it with so many different veggies! I love making my own spice blends too! I usually have a few that I premix and use. They make great gifts too! Thanks Sophia! Love having the blends around...makes it easier sometimes in the kitchen to throw together quick meals. I made this tonight with garlicky Broccoli.....so good. I love your blog, I'm on it a least once a day.Your Indian food recipes remind me of my mom's food. Thanks for sharing your passion of food with us. Oh wow...I love that you used it with garlic and broccoli...that sounds delicious I need to try it! 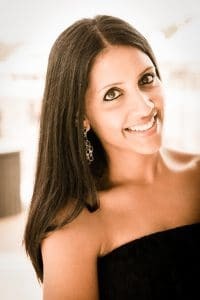 Thank you SO much for the kind words, I love hearing that you're on my site at least once a day =) My Indian food recipes and skills are ones that I've learned myself from my Mom. Although I cook a wide variety of different cuisines, we make traditional Indian food in our house about twice a week. It's sort of second nature to me now, and I've had many people ask me to post the recipes so I've been trying to do more Indian recipes on the site as well. This one is long over-due. It's a favorite of mine, passed down from my mom and grandmother and it really goes so well with everything! I have a great Indian recipe coming soon using this mix! Thanks again for following! If you try out any other recipes of mine, be sure to comment and let me know! Ooooooh! Definitely pinning this - I love making my own spice blends and since Josh and I love Indian food, this is so perfect. Can't wait to see the ways you use it! Thanks Mandy!! You will love this spice mix...it's really perfect to add to just about anything, especially vegetables such as potatoes, eggplant, squash, etc. I have a few recipes coming up if I can ever find the time to sit and work on my posts =) Great hearing from you btw...missed you and hope you're well! Do you think I could sprinkle this over my already cooked food for some extra flavor? 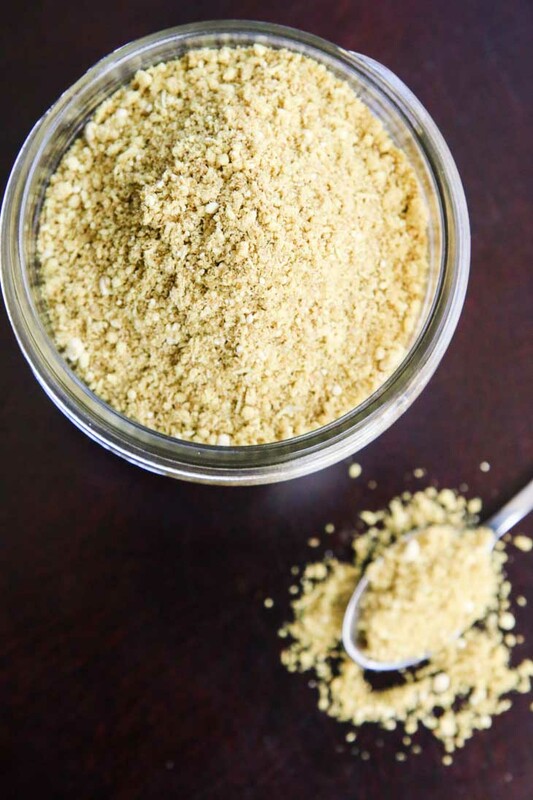 Since the chickpea flour is already roasted, yes, you could totally sprinkle this over already cooked food. As long as it has a little moisture to stick to, or if it's hot and you sprinkle and mix it in, it'll take on some great flavor and not taste like flour being added on. Let me know! I LOVE this mix and have a constant supply in my fridge!